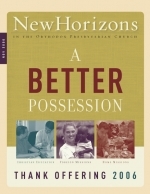 The book of Hebrews teaches that the new covenant brings that which is heavenly and abiding, and, consequently, "better." That which is better includes "a better hope" (7:19), "a better covenant" (7:22), "better promises" (8:6), "better sacrifices" (9:23), "a better country" (11:16), "a better life" (11:35), and "better" provision (11:40). What is the cure for discontentment? God addresses this in 1 Timothy 6:6-10, 17-19.